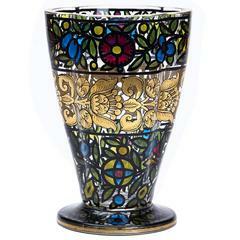 These elegant vases are testament to the quality of Bohemian glass-making in the 19th century. 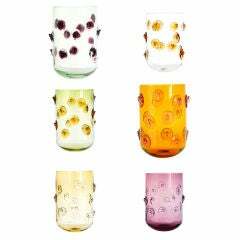 Bohemia (now a part of the Czech Republic) was famous for its glassware since the Renaissance, but it was in the second half of the 19th century that production really took off. 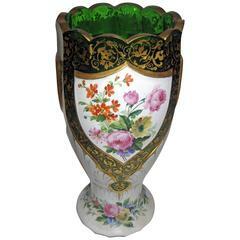 In this period, finely coloured, painted, etched and enameled glass pieces were exported from Bohemia across the world, where they were purchased by royalty, nobility, and other members of the social elite. This pair of opaline (opaque) glass vases will make a beautiful addition to a well-furnished interior. 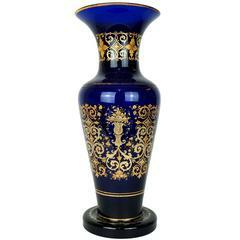 They feature tall, slender cylindrical necks, decorated with parcel gilt, light pink geometric patterns. Lower down, the vases’ bulbous white bodies have been carefully hand painted with playful depictions of winged putti, surrounded by colourful (pink, blue and red) scrolls, and flowering foliage. The vases are set on short circular white feet, which are encircled by gilt bands.